upper Sets the parameters for the area of interest where the fractions are calculated. You also set the search interval in degrees and from where the search should take place within each grid. middle Specifies the input data regarding polygon layer and the land cover raster grid that should be used. Select if the search should be performed from one side of the grid to the opposite side. 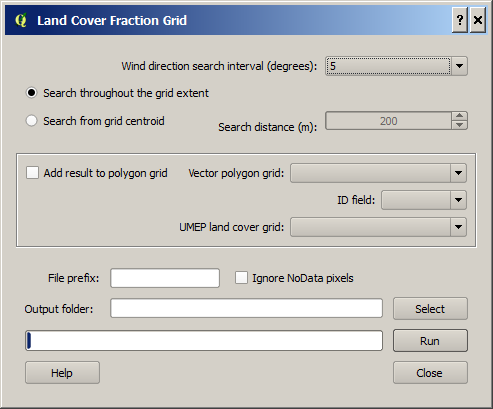 Select the other option (Search from Grid Centroid) if the search should start from the centroid of the grid. Setting the Search distance can then allow for the search to extent beyond the grid. See the figure below for illustration. 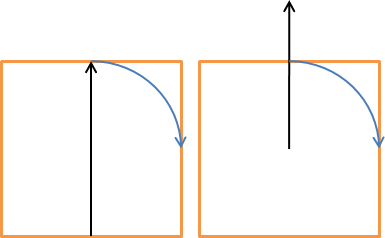 The left performs a search using the grid extent whereas the right illustrates a search from the centroid and extending outside of the grid. Choose an attribute from the selected polygon layer that will be used to separate the different polygon objects from each other. An attribute field of unique numbers or letters should be used. An integer raster land cover grid (e.g. geoTIFF) consisting of the various land covers specified above. Tick this in if NoData pixels should be ignored and calculation of grid should be performed eventhough NoData pixels exists within that grid. Nodata pixels are set to bare soil (6). If the raster data includes no data values within a polygon object, this grid will not be considered in the calculation. Polygon grids must be squared (or rectangular) and allinged with the CRS used. This will be fixed in future versions so that any shaped grid can be used (see issue #12 in the repository).